A study of out-of-hospital paediatric arrests in Melbourne gives some useful outcome data: overall, paediatric victims of out-of-hospital cardiac arrest survived to leave hospital in 7.7% of cases, which is similar to adult survival in the same emergency system (8%). Survival was very rare (<1%) unless there was return of spontaneous circulation prior to hospital arrival. Sixteen of the 193 cases studied had trauma, but the survival in this subgroup was not specifically documented. Background To assess if ultrasound measurement of the optic nerve sheath diameter (ONSD) can accurately predict the presence of raised intracranial pressure (ICP) and acute pathology in patients in the emergency department. Methods This 3-month prospective observational study used ultrasound to measure the ONSD in adult patients who required CT from the emergency department. 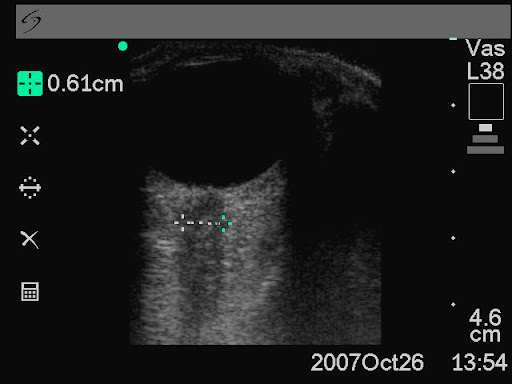 The mean ONSD from both eyes was measured using a 7.5 MHz ultrasound probe on closed eyelids. A mean ONSD value of >0.5 cm was taken as positive. Two radiologists independently assessed CT scans from patients in the study population for signs of raised ICP and signs of acute pathology (cerebrovascular accident, subarachnoid, subdural or extradural haemorrhage and tumour). Specificity, sensitivity and k values, for interobserver variability between reporting radiologists, were generated for the study data. Results In all, 26 patients were enrolled into the study. The ONSD measurement was 100% specific (95% CI 79% to 100%) and 86% sensitive (95% CI 42% to 99%) for raised ICP. For any acute intracranial abnormality the value of ONSD was 100% specific (95% CI 76% to 100%) and 60% sensitive (95% CI 27% to 86%). k Values were 0.91 (95% CIs 0.73 to 1) for identification of raised ICP on CT and 0.84 (95% CIs 0.62 to 1) for any acute pathology on CT, between the radiologists. Conclusions This study shows that ultrasound measurement of ONSD is sensitive and specific for raised ICP in the emergency department. Further observational studies are needed but this emerging technique could be used to focus treatment in unstable patients. The prognosis of cirrhotic patients with multiple organ failure is not universally dismal. A retrospective French study examined predictive factors of mortality and concluded: In-hospital survival rate of intensive care unit- admitted cirrhotic patients seemed acceptable, even in patients requiring life-sustaining treatments and/or with multiple organ failure on admission. The most important risk factor for in-hospital mortality was the severity of nonhematologic organ failure, as best assessed after 3 days. A trial of unrestricted intensive care for a few days could be proposed for select critically ill cirrhotic patients. When assessed against CT as gold standard, ultrasound diagnosis of small bowel obstruction by emergency physicians compared favourably with abdominal radiographs. US exams were performed using a phased array probe in the bilateral colic gutters, epigastric and suprapubic regions to assess for (1) the presence of fluid-filled, dilated bowel (defined as >25mm) proximal to normal or collapsed bowel, and (2) decreased or absent bowel peristalsis (defined as back and forth movements of spot echoes inside the fluid-filled bowel). Either finding was considered ‘positive’ for small bowel obstruction. This aim of the study was to evaluate the tracheal intubation success rate of doctors drawn from different clinical specialities performing rapid sequence intubation (RSI) in the pre-hospital environment operating on the Warwickshire and Northamptonshire Air Ambulance. Over a 5-year period, RSI was performed in 200 cases (3.1/month). Failure to intubate was declared if >2 successive attempts were required to achieve intubation or an ETT could not be placed correctly necessitating the use of an alternate airway. Successful intubation occurred in 194 cases, giving a failure rate of 3% (6 cases, 95% CI 0.6 to 5.3%). While no difference in failure rate was observed between emergency department (ED) staff and anaesthetists (2.73% (3/110, 95% CI 0 to 5.7%) vs 0% (0/55, 95% CI 0 to 0%); p=0.55), a significant difference was found when non-ED, non- anaesthetic staff (GP and surgical) were compared to anaesthetists (10.34% (3/29, 95% CI 0 to 21.4%) vs 0%; p=0.04). There was no significant difference associated with seniority of practitioner (p=0.65). The authors conclude that non-anaesthetic practitioners have a higher tracheal intubation failure rate during pre-hospital RSI, which may reflect a lack of training opportunities. The small numbers of ‘failure’ rates, combined with the definition of failure in this study, make it hard to draw generalisations. Of note is that the paper lists the outcomes of the six patients who met the failed intubation definition, all of whom appear to have had their airway satisfactorily maintained by the RSI practitioner, three by eventual tracheal intubation, one by LMA, and two by surgical airway. More data are needed before whole specialties are judged on the performance of a small group of doctors. A single centre observational study of rapid sequence intubation (RSI) was performed in a Scottish Emergency Department (ED) over four and a quarter years, followed by a postal survey of ED RSI operators. There were 329 RSIs during the study period. RSI was performed by emergency physicians (both trained specialists and training grade, or ‘registrar’ doctors) in 288 (88%) patients. Complication rates were low and there were only two failed intubations requiring surgical airways (0.6%). ED registrars were the predominant RSI operator, with 206 patients (63%). ED consultants performed RSIs on 82 (25%) patients, anaesthetic registrars on 31 (9.4%) patients, and anaesthetic consultants on 8 (2.4%) patients. An ED consultant was present during every RSI performed and an anaesthetist was present during 72 (22%). The average number of ED registrars during this period of training was 8. This equates to each ED trainee performing approximately 26 ED RSIs (6.5 RSIs/year). On average, ED consultants performed 14 RSIs during this period (approx 3.5 RSIs/year). Of the 17 questionnaires, 12 were completed, in all of which cases the trainees were confident to perform RSI independently at the end of registrar training. Interestingly, 45 (14%) of the RSIs in the study were done in the pre-hospital environment by ED staff, two thirds of which were done by ED consultants.